Print Home / Advanced Features / How to Stylize Feedback/Lightbox Title? - You may replace the value of font-family with any Web Safe Fonts you prefer. - It is also possible to modify the title's font-size to suit your needs. - Aligning the title to center, left, or right is also doable. 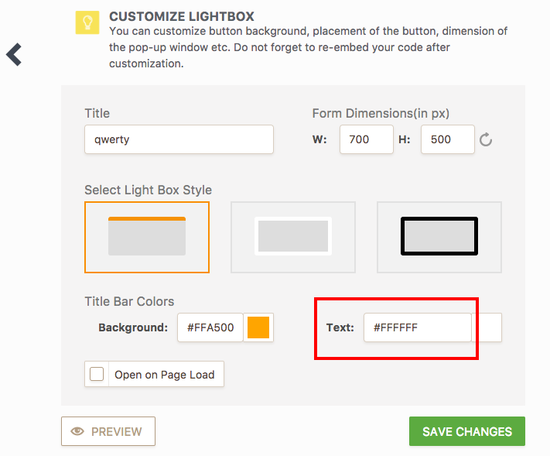 Font-color and title bar background color can be changed in the Lightbox/Feedback Embed Form Wizard. How can i change the title font-weight, shadow, remove the border below the title? How can I add the word Close next to the X, in the title bar, for the computer challenged customers please?